New internal components for all 2016 Crankbrothers pedals (click to enlarge). 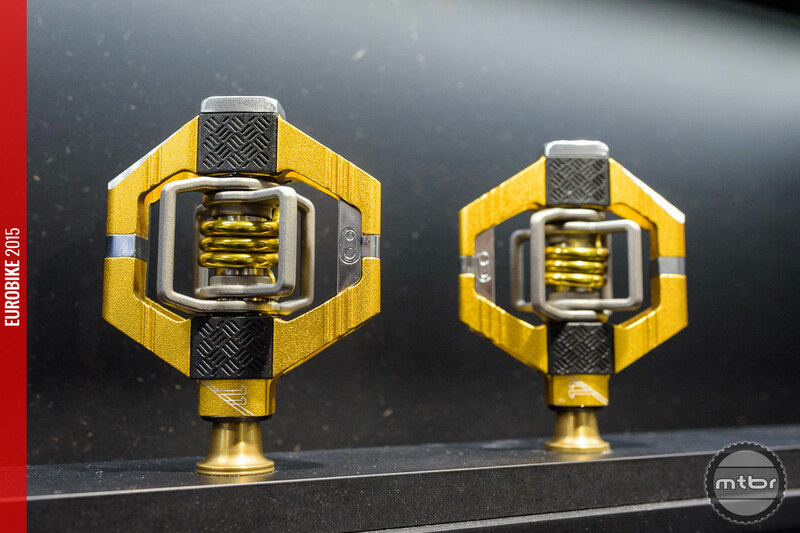 Crankbrothers made an in depth redesign of the internal components of all pedals. First, enduro cartridge bearings are used as outboard bearing for all 2016 clipless pedals. The new igus LL-glide bearing now has an exclusive formulation for Crankbrothers and is, as inboard bearing, claimed to have 8x better performance in igus lab testing (applies for all 2016 pedals). Furthermore, a double seal system consists of a double-lip internal seal and a new external seal. This sealing is used for all 2016 pedals. The new Traction pad technology has directly been integrated in the Mallet E, Candy 11 and Candy 7 pedal models. It consists of a polyurethane pad with a diamond plate traction pattern on both sides of the cleat interface of the pedal. Depending on your sole, you can choose between 1 or 2mm interchangeable pads, that are included with the pedals. The pads are intended to optimalize cleat engagement and shoe tread contact with the pedal body. The pads are customisable to get the perfect interface for any shoe. The Mallet E enduro pedal (click to enlarge). 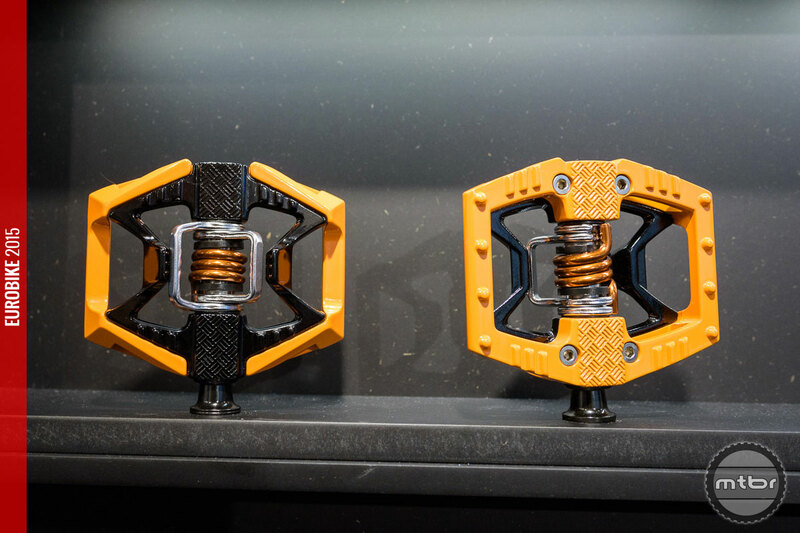 12% smaller and 50 g lighter than the Mallet DH pedals, the Mallet E(nduro) come with a 52mm q-factor (imagine tight trail sections) and have traction pads integrated. The pedal platform is concave and has 6 adjustable pins per side doe grip, as well as a ribbed body for better traction when unclipped. The edges of the pedals are chamfered to reduce rock strikes. A hex alloy end cap is used for extra durability. The revamped Candy 11 pedal (click to enlarge). The higher end Candy 11 & 7 pedals get an all new body shape. 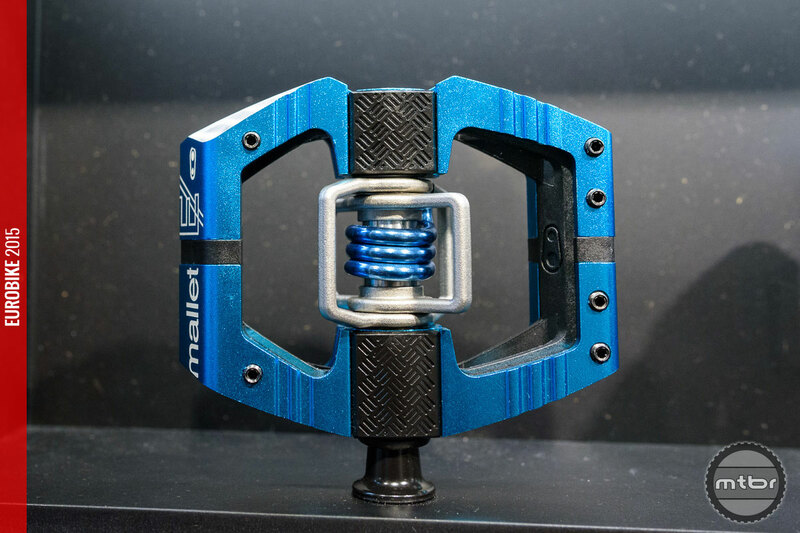 As the Mallet E pedals, the Candy 11 & 7 also have traction pads and a ribbed body for better traction when unclupped, as well as chamfered edges. The hex alloy endcap also functions as bashguard for enhanced durability. The Double Shot pedal combines a flat and a clip-in pedal (click to enlarge). In doubt whether you should choose flat or clipless pedals? Maybe the Double Shot pedals are a solution. A hybrid pedal, half is flat and half is clip-in. On the flat side the traction is optimized through the use of moulded traction ribs and pins. The clip-in side has a double diamond traction area. The pedals’ open structure provides good mud shedding. The Stamp flat pedal is available in Small and Large sizes (click to enlarge). Depending on your shoe size, you can now choose different size flat pedals with the new Stamp pedal. The Small size is 100mm long and 100mm wide. The Large size however, has a staggering 114mm of length and a width of 111mm. Finally, Bigfoot can ride a mountain bike too! 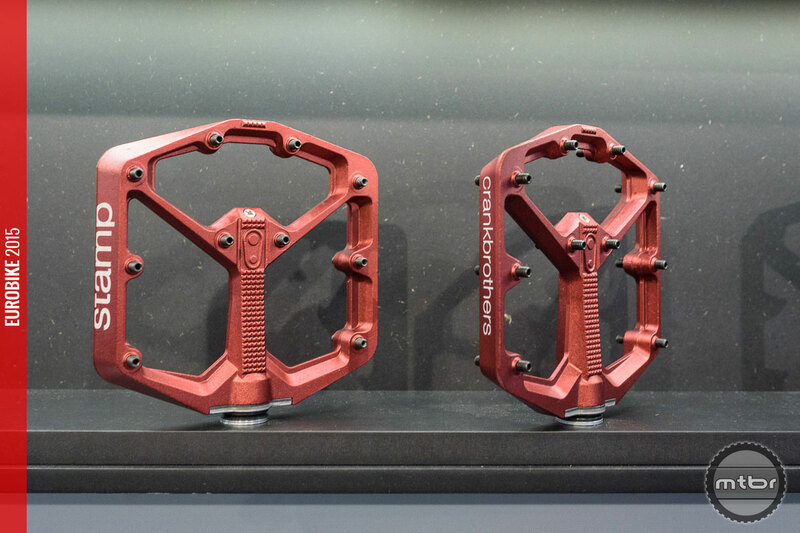 The pedals have a minimal profile: 11mm thickness at the center concaveing into 13mm outer thickness – a more concave for secure foothold and a thinner profile than the competition, which reduces weight and rock strikes. Jeroen is a contributor based in Belgium. He is expert in the field of photography and a fan of local beer. I asked about a pedal like the doubleshot over a year ago and they said they weren’t working on one. Too bad I already bought another pair of eggbeaters, I’d love a set of these instead.